The jet in M87 connects the innermost black hole to the outer parts of the source. It supplies the radio source and the surrounding region with energy and relativistic plasma. These images show it retains a self-similar structure as we "zoom in", from the largest scale (a few kpc, top image) to the smallest scale yet observed (a parsec or so). We expect that on still smaller scales, this similarity must break down when we reach the black hole and surrounding accretion disk. 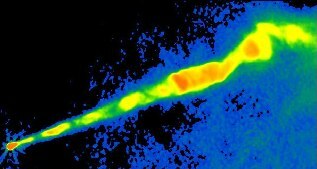 The jet seen by the VLA at 2 cm (from Biretta & Owen). The scale from the bright core (at the left) to the outermost bright spot (where the flow starts to bend) is about 2 kpc. 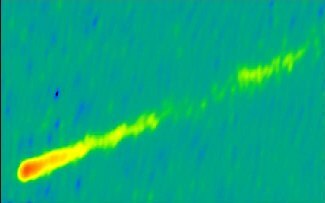 Two views of the jet from the VLA at 7 mm (from Owen & Biretta). 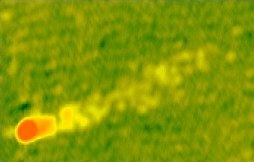 The outer "fuzzy" patch on the left-hand image corresponds to the first bright knot seen just past the core, in the 2 cm image above. The image on the right is a flow-up of the core in the left-hand image. 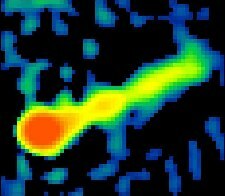 A VLBI image of the jet at 18 cm (from Biretta & Junor). The length of the visible jet is about 17 pc. 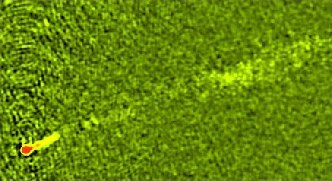 A VLBI image of the jet at 1.3 cm (from Biretta & Junor). The length of the visible jet is about 2.5 pc. The physical scale of the innermost jet features, next to the unresolved core source, is about 0.1 pc (1/3 of a light year), about 100 times the size of the black hole which drives the system.